Cheese curds are shaped and aged into various cheese types. During the cheese-making process, milk is separated into curds and whey. The curds are the result of the milk proteins solidifying, and the whey is the off-white to yellow liquid left behind. 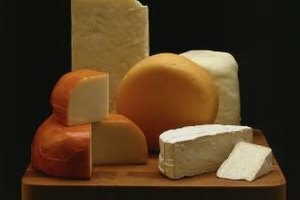 You can eat the curds plain -- commonly called farmer's cheese -- immediately after separation, or you can strain, shape and age them to create cheese varieties such as mozzarella and cheddar. Raw milk is easiest to separate into curds and whey, but it may be hard to find. Instead, use store-bought, pasteurized milk, but avoid ultra-pasteurized milk because the high heat makes curd formation more difficult. Add the milk to a large pot and warm it slowly to 68 degrees Fahrenheit. Avoid pots made of cast iron and aluminum. Clip a digital thermometer to the side of the pot so that you can get an accurate temperature reading. Stir in buttermilk or plain yogurt, which has active bacteria cultures to inoculate the milk. For every gallon of milk, use 2 to 3 tablespoons of buttermilk or 1/3 cup of plain yogurt. These additions increase the acidity of the milk and make it easier for the milk to form curds. Some cooks use lemon juice and vinegar at a rate of about 3 tablespoons per gallon of milk in place of the buttermilk or yogurt. Alternatively, add 2 teaspoons of citric acid to 1 gallon of milk to inoculate the milk. Cover the milk pot with a lid, remove it from the heat, and leave it at room temperature overnight to allow the buttermilk or yogurt to take effect. Bring the pot of milk up to 86 F the following morning. Stir frequently to prevent the milk from scorching on the bottom of the pan. Remove it from the heat when it reaches the proper temperature. Dissolve a rennet tablet in cold water at a ratio of 1/4 rennet tablet to 1/4-cup water per gallon of milk until completely dissolved. Stir the dissolved rennet and water into the 86 F milk. Place a lid on the pot and allow 1 to 3 hours for the milk to separate into curds and whey. The solid curd forms at the top of the pot, while the whey stays at the bottom. Insert a finger into the curds forming at the top of the pot. Curl up your finger to remove it from the milk. The gelled milk must break cleanly, which means that your finger is not covered with milk, and the split on the surface holds its form after you remove your finger. If you don't have a clean break, cover the pot and check again once every 30 minutes for up to 3 hours, until the milk has solidified enough to break cleanly. Insert a knife through the top of the curds and cut 1/2-inch stripes across the surface. Slice through the curds in the opposite direction to form 1/2-inch cubes. Spoon off the whey on top of the curds. Replace the lid and wait about 15 minutes. 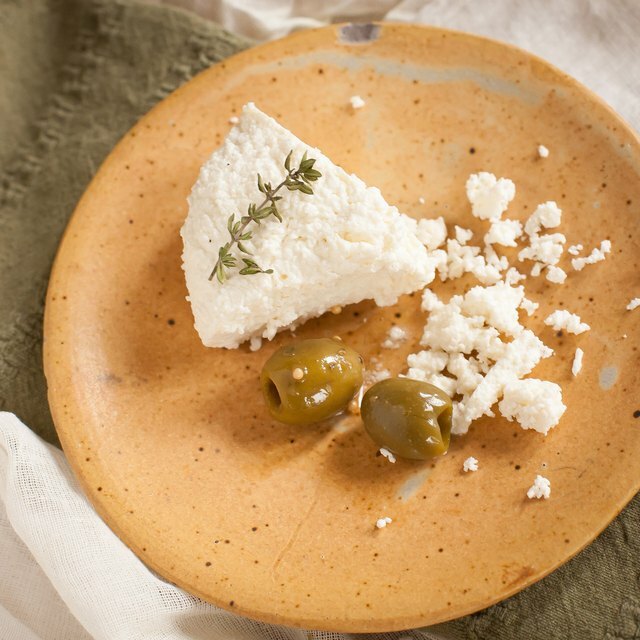 Heat the curds over low to medium-low heat to a temperature of 95 F to make soft cheese or 102 F to make hard cheese. Stir the curds occasionally while heating and break up any large curds. Remove it from the heat when the curds become firm. Place a strainer over a second pot. Pour the curds and whey through the strainer. The whey falls through the strainer and into the second pot, while the curds collect in the strainer. Allow a few minutes for the excess whey to drain from the curds, and move the curds to a large bowl. Sprinkle salt over the curds to cure them so they don't spoil. Add 1-1/2 to 2 tablespoons of salt for every gallon of milk used. Move the curds into a piece of clean cheesecloth and squeeze off the excess whey. You can eat the curds fresh at this point. If you want to cure the cheese, you must place a weight on it to strain out the whey and shape it. Replace the cloth each day until the cloth is no longer wet when you check it. You can shape, press and age fresh cheese curds or use it to make a popular dish, such as poutine. Save the whey for making fresh ricotta or substitute it for plain water when cooking rice or other grains.